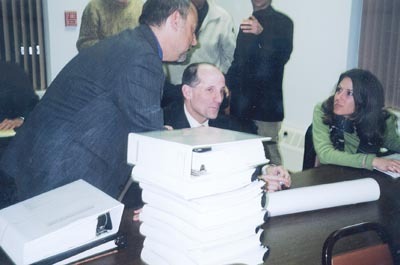 GERRY FOUNDATION CHAIR Jonathan Drapkin, center, and Denise Frangipane, also of the foundation, confer with lawyer Larry Wolinsky, left, about the draft environmental impact statement presented to the Town of Bethel Town Board and Planning Board Tuesday night. BETHEL  March 8, 2002  The performing arts center planned for the Woodstock site in Bethel was one step closer to reality Tuesday night when the Gerry Foundation filed their Draft Generic Environmental Impact Statement (DEIS) with the Bethel Town and Planning boards. The presentation was made at a joint meeting held at the Bethel Senior Center. Both boards had to be present because each are acting as lead agency. The Gerry Foundation is spearheading the project. The proposed project will be a 634-acre Performing Arts Center Development District. The first phase will feature a pavilion, seating for 17,500, a welcome center, festival stage, and temporary retail area. If the process continues on schedule, this phase is scheduled for completion by September 2004. In future development there is expected to be a performance hall, school for the arts, music attraction/museum, and lodging. But before any construction can begin, the Gerry Foundation has to receive full approval from the town, starting with its environmental impact statement. The DEIS was presented Tuesday by Gerry Foundation Executive Director Jonathan Drapkin and land use attorney Larry Wolinsky of Jacobowitz and Gubits. A scoping document was presented to the boards last June for review, but Drapkin explained some of the changes they had to make to complete the DEIS. One critical change was to move the proposed pavilion further south, away from the original 37-acre site on the old Gabriel farm. The change was made because the planners discovered solid bedrock under the ground of the original location, and it would become cost prohibitive to build there. Parking will also be moved because the planners discovered the proposed parking site was on a wetland. Another big change is to not create a new Hurd Road as originally planned. With the location shifting, Hurd Road does not need to be moved. Drapkin also discussed some things that will be looked at for future consideration. A water tower will be built in the northwest corner of the site on very high ground. Drapkin also mentioned how the world had changed since the tragedy of September 11. Drapkin said the foundation now feels that security measures will be needed with thousands of people going though the area. That will be something they will look into, he noted. Once Drapkin was finished, Town Engineer Tom Shepstone explained the next steps in the process. The board members have up to 45 days to review the DEIS. They are to review the document to make sure it is complete. That period, according to the schedule, is from March 6 to March 22. On April 4, if there are no major problems, the board is scheduled to accept the DEIS and schedule a public hearing. From April 5 to April 26, consultants will review the project for issues and impacts. A joint hearing on the DEIS and the zoning local law (to do the project, the zoning law must be changed) will be held May 7. The submission of the Final Environmental Impact Statement (FEIS) to the boards is scheduled for July 13. If the process continues on schedule, the town would then accept the FEIS as complete by July 16. On July 30, the combined board would adopt the SEQR findings and the zoning local law. On August 8, it would be submitted to the Planning Board and a special permit hearing would be scheduled. That hearing would take place Aug. 27. Shepstone and Scott admitted it is an ambitious schedule. However, all involved feel it can be done in that time frame, as long as no major problems arise. It is tentative and subject to change.